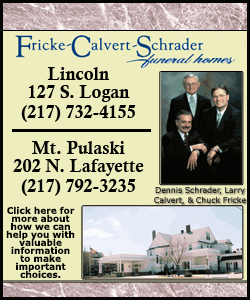 [April 23, 2019] LINCOLN - Robert W. “Bob” Kindred, 86, passed away at 9:19 a.m. on April 10, 2019 at his home. Robert W. “Bob” Kindred, 86, passed away at 9:19 a.m. on April 10, 2019 at his home. Bob was born on December 13, 1932 in Atlanta, son of Lloyd and Mildred (Graham) Kindred. He married Helen Marie Rice on July 8, 1956 in Lincoln. She preceded him in death on July 9, 2002. Surviving Bob are his sons: Randy Kindred of Lincoln and Steve (JoAnne) Kindred of Lincoln; three grandchildren: Cassie Kindred, Marissa Kindred, and Miranda Kindred all of Lincoln and one brother, Kenneth (Shirly) Kindred of Atlanta. Bob was preceded in death by his parents, one sister: Jean, and one brother: Lyle. Bob proudly served in the United States Army from 1953-1955. He was a service manager at Graue Chevrolet. Bob loved to spend time with his family and friends. Services for Bob will be 4:00 p.m. Sunday April 14, 2019 at Fricke-Calvert-Schrader Funeral Home in Lincoln with Rev. Ray Pepple officiating. Visitation will be two hours prior (2:00-4:00 p.m.) to the service. Burial at Atlanta Cemetery will be held at a later date where full military rites will be accorded by the American Legion Post # 263. Memorials may be made in Bob’s name to the American Diabetes Association.